Water Proofers | CMI Marketing Sdn. Bhd. CMI PROOFCOAT 087 is a high quality two component polymer modified cementitious waterproofing slurry. 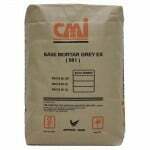 CMI PROOFCOAT 087 is used on concrete and mortar surface to prevent damping and water infiltration. It can be used for internal and external applications. The substrate to be treated can be existing or new. CMI BMG EX 981 is a high quality polymer modified water-resistant cement-based thin plaster specially formulated for exterior concrete wall surface coating. It can be used for surface improvement, patching and general repair work on uneven wall and ceiling areas in interior and exterior applications. CMI ELASTI-SEAL is seamless water based elastomeric waterproofing coating. CMI ELASTI-SEAL provides absolute sealing and waterproofing for cracks, pre-castingjoints and all types of roofing including zinc, galvanized, asbestos, cement concrete tiles and roof-slate etc. Also useful for cracked roof-gutters and flashing.